With states meeting this week to discuss concerns over lethal autonomous weapons systems at the UN in Geneva, a group of UK-based tech companies, non-governmental organisations (including Article 36) and academics wrote to the UK government to take action for the prohibition of these systems. The signatories urged the government to show leadership in ensuring that meaningful human control is maintained over the use of force globally, as states seek to develop increasingly autonomous weapons systems. It is reproduced in full below or can be downloaded as a PDF here. We appreciate the UK’s commitment to international leadership in “ethical AI”, as heralded in the Prime Minister’s 2018 Davos speech. Such leadership is socially important and builds on the UK’s strengths in research and innovation as well as positioning the UK as a global leader in this area. We are concerned, however, that without political leadership to limit the role of AI in certain functions of weapon systems, wider efforts to establish an ethical approach to AI could be undermined. Empowering algorithms to identify and select targets for the use of weapons raises fundamental challenges regarding the role of machines in society. If we are prepared to accept that empowerment, without some obligation for meaningful human control in its functioning, then it becomes hard to see in principle what other functions AI-systems should be barred from undertaking. 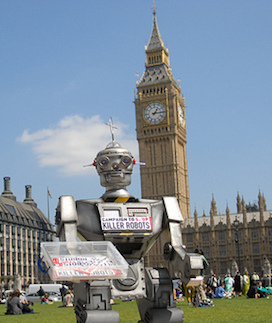 We welcome the UK’s stated intention not to develop Lethal Autonomous Weapons Systems (LAWS) but believe that clear international consensus on this would send a strong signal to all those around the world working on AI. The UK has an opportunity to show leadership at the meeting of the Group of Governmental Experts on LAWS at the UN Convention on Conventional Weapons taking place this week in Geneva. We call on the UK to use that meeting to articulate its commitment to meaningful human control over weapon systems, and to work to build consensus on the mechanisms through which sufficient human control can be achieved. A large number of tech-sector entrepreneurs, as well as the global engineering professional body the IEEE, have already made clear their recognition that meaningful human control needs to be retained as the capacity for autonomy in weapons systems develops. Such a commitment will not limit innovation in AI. Nor does it amount to a blanket exclusion of AI- functions or autonomous capacities in the military sphere. The development of AI capacities offers great social and economic potential and the UK is ideally placed to benefit from that potential as well as to help, at an international level, to avoid the attendant risks. However, developing ethical AI leadership requires us to show leadership in all areas where AI can have a transformative effect. Without concerted action to prohibit LAWS we stand on the verge of a stark dehumanization of how military force might be applied. As a country looking to forge a ‘bold new role’ in the interests of Britain and the world, we believe taking international action to prevent the development of LAWS should be an important strand of the UK’s vision of a ‘Global Britain’. We hope that the UK will start to show leadership towards an international obligation to ensure meaningful human control in the context of autonomous weapons. We remain committed to ongoing dialogue that can ensure that such an obligation supports our shared vision of AI for the social good.